Come and tour this AMAZING new home. Located on a cul de sac in Blue Heron Estates on the Northside of Evansville. 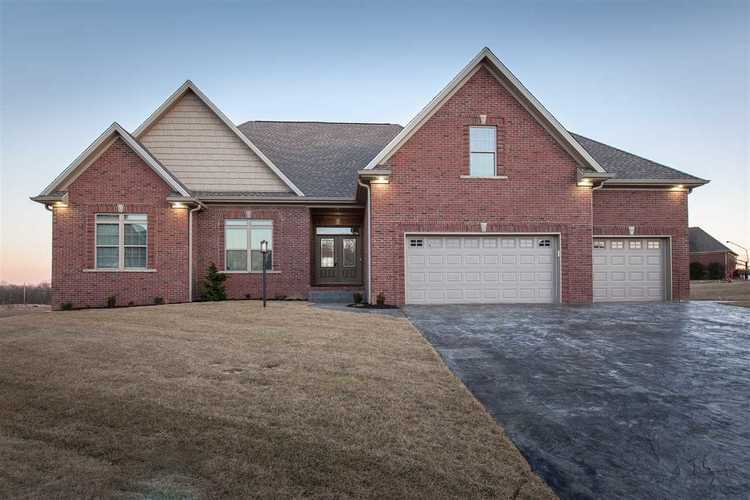 This brick 5 bedroom 4 full and 2 half bath home is sure to please the most particular home buyer. Perfect for entertaining with the open living room, dining, and kitchen. This kitchen offers a gas range, microwave, dishwasher and large island for more countertop space. There is a great covered porch off of the dining room overlooking the backyard. Living room offers a contemporary stone tiled fireplace and built-in bookcases with storage on each side. Large master suite with a walk-in closet and large bath with marble floors and tiled shower. The upstairs offers the 4th bedroom and a large bonus room. The finished walk-out basement is sure to be the place to be with large family room and outdoor kitchen on the patio. The basement also offers an additional bedroom and 1 full and 1 half baths.